Images from Easter Sunday celebrations across the world. 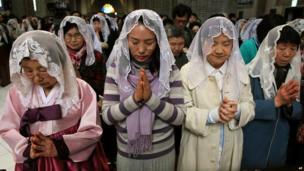 Christians around the globe have been celebrating Easter. 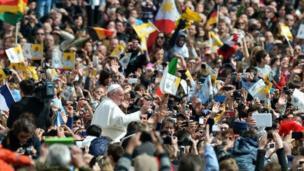 Pope Francis presided over his first Easter Sunday Mass in St Peter's Square since being elected. 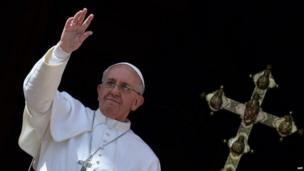 The Pope used his "Urbi et Orbi" address to call for peace in Africa, Asia, the Middle East and across the globe. 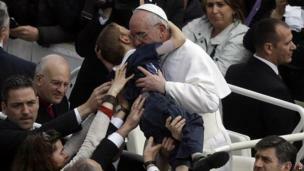 Francis hugs a child, one of the tens of thousands of people who attended the Mass at the Vatican. 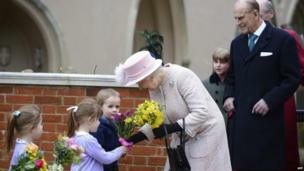 In the UK, Queen Elizabeth II received flowers as she left St George's Chapel at Windsor Castle with Prince Philip after an Easter service. 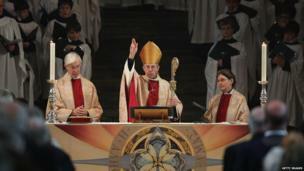 The Archbishop of Canterbury, the Most Reverend Justin Welby, led an Easter service at Canterbury Cathedral. 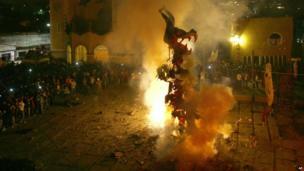 A giant 5m effigy of Judas Iscariot burns in the Santa Rosa Xochiac church, in Mexico City. This Easter ritual is practised in many countries around the world, including parts of Latin America, Greece and the Philippines. 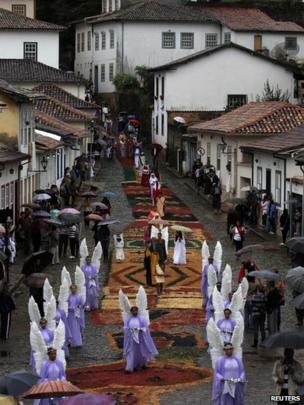 Brazilians dressed as angels and Bible characters join an Easter procession, along a carpet decorated with sawdust and flowers, in the city of Ouro Preto, Minas Gerais state. 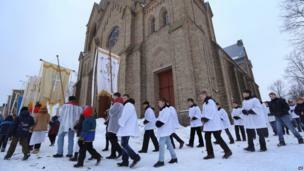 Catholic worshippers in Rakov, 45km (28 miles) north-west of the Belarusian capital, Minsk, take part in a Sunday procession. 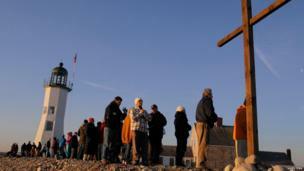 American Christians pray during an Easter sunrise service in Scituate, Massachusetts. 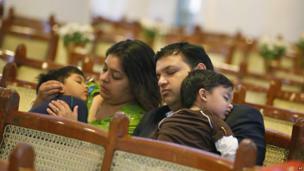 In warmer climes, the heat took its toll on worshippers at an Easter Mass on Sunday in the Indian city of Bangalore. 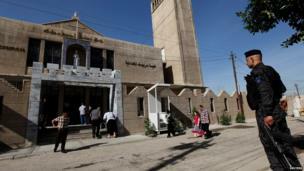 Security was tight at St Joseph Chaldean Church in Baghdad for an Easter Mass. Tight security too in Pakistan as worshippers attended churches across the country, including here in Islamabad. 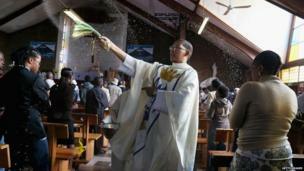 Holy water is sprayed on a congregation in the Soweto area of Johannesburg in South Africa. Church gatherings were praying for the health of ailing former President Nelson Mandela. In South Korea, the military tensions on the peninsula have been a key concern, and Catholics at the Myeongdong Cathedral in the capital, Seoul, prayed for peace. 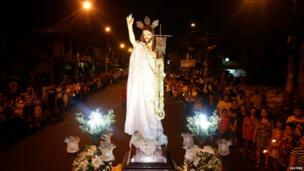 Crowds gathered for a procession of the risen Christ, at dawn on Easter Sunday at a church in Mandaluyong City, Manila, the Philippines.